BlogHome » The nitty gritty of tooth microwear in moles: why it matters to palaeontologists! When an animal eats food it creates a pattern of scratches and pits on the tooth’s surface known as dental microwear. The textures produced depend on the hardness of food items, so softer foods create textures with fewer scratches and pits, and harder foods create textures with more. Microwear textures of modern-day animals have been widely studied and it is now known that certain microwear textures relate to certain food types. For example, an animal that eats fish will have a different tooth microwear texture to one that eats beetles. This technique has been applied by palaeontologists to determine the diet of long extinct animals, because microwear textures can be preserved on teeth even after they become fossilised! The diets of extinct animals, including dinosaurs, pterosaurs and prehistoric mammals, have been studied using preserved dental microwear, and this has allowed us to reconstruct past ecosystems and food webs in great detail. However, there is currently a debate among researchers about whether microwear on teeth is created dominantly by an animal’s food (as long supposed) or actually by hard grit particles from the environment that can coat food (a recently proposed idea). If environmental grit is the dominant factor, dietary information from tooth microwear could be obscured and previous interpretations for the diets of extinct animal diets could be misleading or incorrect. Our study set out to investigate whether environmental grit does actually have an effect in obscuring dietary signals from tooth microwear, and to do this we wanted to study modern-day moles. Moles live in soils of widely varying grit contents (e.g., sandy soils versus peaty/clayey soils), they feed underground, and their food (mainly earthworms and insect larvae) also contains and is coated by grit. 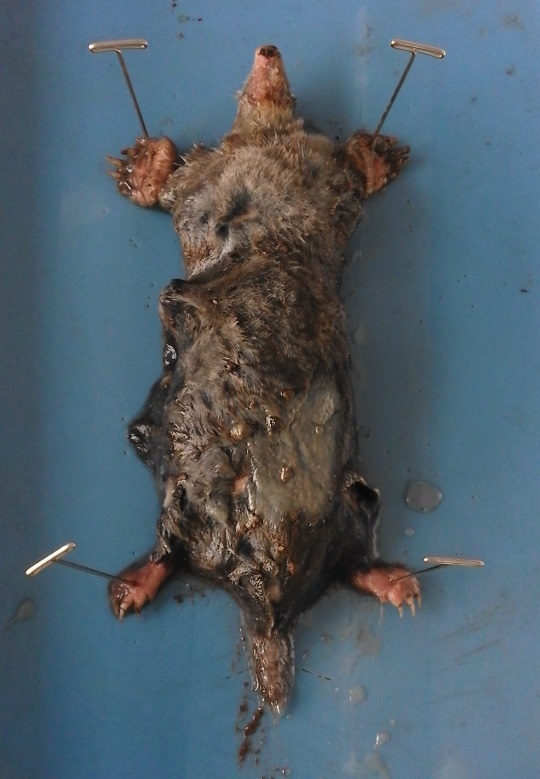 In addition, most food items eaten by moles are quite soft, so we would not expect much variation in dental microwear if diet is the main control on microwear formation. These qualities made moles ideal for studying the effect of grit on microwear textures, shedding new light on this ongoing debate. Thanks to the hard work of the Lady Mole Catcher, Louise Chapman, 26 moles were sourced from her clients across Norfolk and soil samples were taken from every mole collection site. Over the summer of 2018 the moles and soils were studied by our team in the Centre for Palaeobiology Research in the School of Geography, Geology and the Environment at the University of Leicester. The soils were analysed for their grit contents and the moles were dissected to investigate their stomach contents and to look at their dental microwear. We conducted a number of detailed statistical analyses and were unable to find any relationships between the grittiness of soils the moles were living in and the microwear textures on their teeth. The microwear was much the same on teeth of moles from soils of different grit contents – not what we would expect if grit was a major factor in the formation of microwear textures. 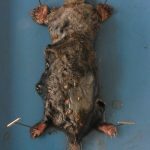 This result is consistent with our expectation that, because mole diet doesn’t vary much, textures should be more or less the same in different moles, supporting the use of microwear texture analysis as a powerful tool for palaeontologists in determining the diets of long extinct animals. Images showing: (1) a mole pinned out ready for lab dissection to extract and study stomach contents and to extract jaws and teeth for dental microwear analysis, (2) a mole tooth that has been gold-coated to better show the microwear features such as pits and scratches on the enamel surface, and (3) examples of two 3D digital models of the tooth surfaces generated by focus variation microscopy (the surfaces are 140 x 110 micrometres in size).. These images are from the teeth of moles that lived in the soil with the lowest grit contents (on the left) and the soil with the highest grit contents (on the right), and both have very similar microwear features.